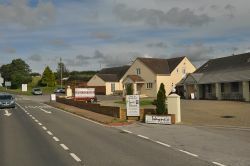 Single site located between junctions at the side of the road. An unremarkable Little Chef gave way to a truly unique restaurant. The former Camel Cross Garage. The restaurant here was originally the Frying Pan Cafe, planned in 1959 and opened in 1963. In 1967 a motel was planned to be added here. By 1980 there were plans to demolish and re-build it, but the building was then damaged by a fire in 1984. At this point the building was demolished and replaced by what was supposed to be a Little Chef, but opened as a Happy Eater. In 1996 this became the Sparkford branch of Little Chef anyway. Granada wanted this restaurant to be a pilot site for a "new concept", which was called Little Chef Express and had a blue colour scheme, with rounded logos showing its mascot running and the word "diner" written all around the building. In 1997 the trial was ended and the colour scheme reverted to normal, albeit with a few blue mascots still around. 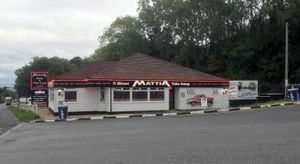 In 2008 it closed entirely and is now the Mattia Diner, which has been covered with distinctive Elvis memorabilia. Two miles to the west of here (near the B3151 exit) was another service station called Camel Cross. It was one of the original (pre-1974) Welcome Break Cafes, and had been converted to a Happy Eater by 1979, which was later closed in favour of Camel Hill. It was positioned next to a garage called Camel Cross Motors, which was built in 1948. The junction is now closed, the garage is a bar and bistro, and the restaurant is now a bed and breakfast. The petrol station was built in 1967. It was once operated by Shell directly, but was sold to MFG, who upgraded the forecourt and shop throughout mid-2016, changing the shop from Select Shop to Londis in the process. At the back of the services is a fenced off area, which appears to have been an exit through to Gason Lane. Planning permission has been granted to MFG in March 2018 for demolition and redevelopment of the current forecourt. The plans also include the building of a drive thru coffee shop on waste land situated behind the current forecourt. In September 2018, the forecourt was put up for sale during a period of CMA investigation into the merger of MFG and MRH and was sold in April 2019 to another independent operator. It has been rebranded from Shell to Texaco and the shop has also been rebranded from Londis to Best-One.